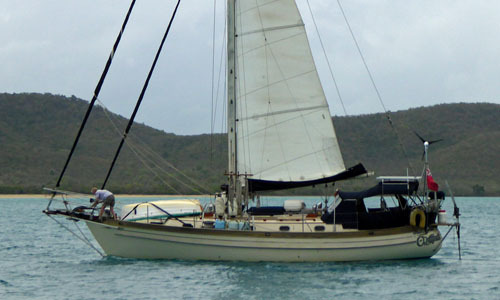 One of the problems with a cutter rig become evident when it's time to tack; the bowlines attaching the jib sheets to the clew of the headsail can get caught up on the inner stay as the bow goes through the wind. Having put up with this for years I've now decided it needs sorting. The solution? Splice a small loop in the end of each sheet and attach them to the clew with a soft shackle. They'really easy to make up, after all they're nothing more than a length of rope with a spliced eye at one end and a stopper knot at the other. 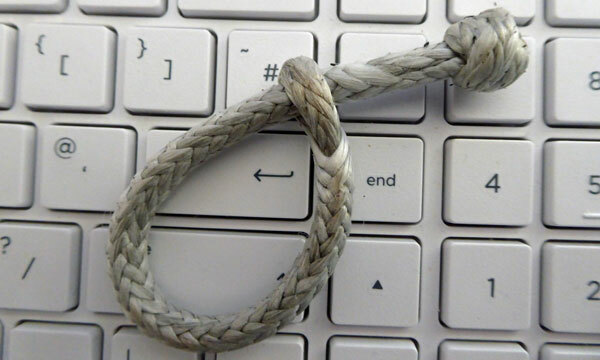 Take a look at Soft Shackle Tying to see how it's done. Although the rigger I spoke to said that 6mm Dyneema would be adequate for anything on my 38 foot (11.5m) sailboat 'Alacazam', I decided to use 7mm as the universal standard for my soft shackles in future. That's 15 so far, which is why I'm knocking them out with the fervour of a future grandmother knitting socks and stuff for her first grandchild. Are you familiar with Pinterest? I wasn't until recently. Seems it's an image-based social-media search engine - sort of. Being a glutton for punishment, I thought perhaps sailboat-cruising.com should have a presence on it. Fishing at anchor is best done with your baited hook placed firmly on the seabed - and after sunset. Normally you won't have to wait too long before an interested customer shows up, particularly if your bait is a piece of fresh oily fish or squid. Sometimes though, when the fish are not so accommodating, you may get involved with something else on board, leaving your fishing line unattended. If a fish takes your bait now, he'll swallow it greedily taking both it and the hook into its gut. Now the fish will be in some discomfort at best, or severe pain at worst - and no living creature deserves that. If you're likely to leave your line unattended you need to replace your normal hook with one of these; a circle hook, so-called because of its inward facing point. Now, if the fish swallows the hook, any tension on the line will pull it back into its mouth, the inward hook point failing to catch on any internal part of the fish. But when the direction of pull changes as the hook is drawn from the fish's mouth, the hook will secure a firm hold in the hinge of the jaw, from where it can be easily removed with little or any lasting damage to the fish. 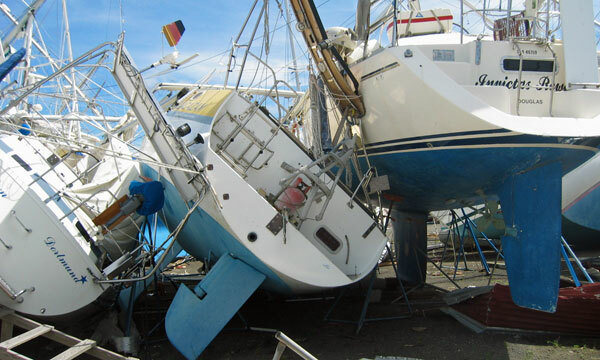 The problem with yacht insurance is that you don't know if its worth having until you need it. Will your insurance company pay up in accordance with their general obligations or try and wriggle out of them wherever they can? Back in 2004, Hurricane Ivan resolved any doubts I may have had about my insurers. The vessel store alongside Alacazam was blown over, in turn knocking Alacazam over into the boat on her starboard side. As you can see, she suffered a deal of damage as a result. My insurers own surveyor reported that "Alacazam's mast was of superior quality and should be replaced by one of similar quality." Pantaenius, my insurers, made sure of that by having a new identical mast fabricated by the original UK suppliers and shipping it out to Grenada, rather than having one made up locally at a much lower cost. Their support during Alacazam's repair was outstanding, which is why they continue to insure Alacazam to this day. 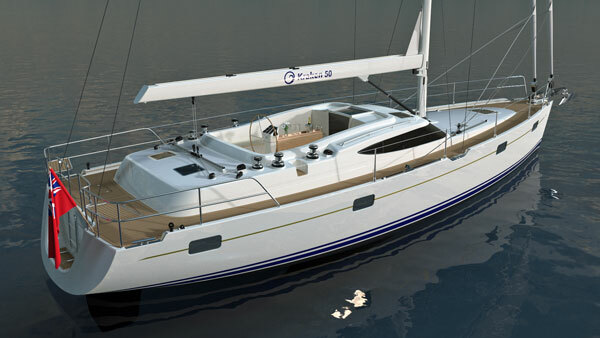 Consequently I was delighted when Pantaenius approached me about advertising on sailboat-cruising.com. I have absolutely no hesitation in recommending them to you. Kraken Yachts have commissioned award-winning New Zealand designer Kevin Dibley to produce a new yacht that is ‘Built for Purpose' - and that purpose is to be a true Blue Water Cruiser. An internal raised navigation station enables crew to stay warm and dry when on watch in bad weather. What makes a safe and comfortable Blue Water Cruiser? There were several different suggestions for the identity of last month's mystery boat, including a Hinckley Sou'wester 42, a Hinckley 43 and a Bristol 39/40. Thanks to all of you for your replies, but my money is on it being a cutter-rigged version of the Hinckley Sou'wester 42 Mk2 introduced in 1995. A heavy displacement, canoe-sterned cutter preparing to drop the hook in Five Islands Bay, Antigua. Various items items for an Ericson 35.